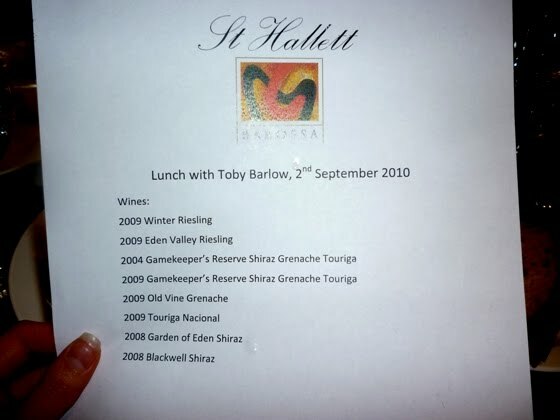 A St Hallett lunch (http://www.sthallett.com.au/) was held @ Bistrode CBD with St Halletts winemaker Toby Barlow last week. St Hallett has been producing well established wine from Barossa since 1944, with a good resource of old vines and grape growers to produce full flavour, texture and body. Toby and Stuart Blackwell (the other head winemaker) contribute a wealth of experience to their wines, and are happy to do new things outside what Barossa is well known for, such as using the Touriga Portuguese grape variety. St Hallett 2009 Winter Riesling – uses malolactic fermentation (which increases “creaminess” and texture). St Hallett 2009 Eden Valley Riesling – not using malolactic fermentation; light (in body and in alcohol), refreshing and overall dry style. Rrp about $25. St Hallett 2004 Gamekeeper’s Reserve Shiraz Grenache Touriga – Bright in colour and perfumed on nose, with stewed plum, black cherry and spices. On palate, also bright with juicy berry fruits, but perfect drinking now. Rrp about $20. 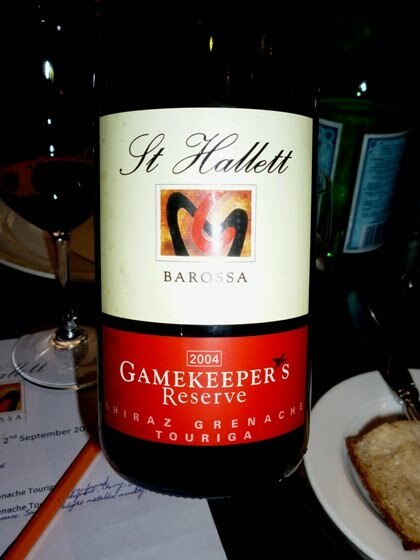 St Hallett 2009 Gamekeeper’s Reserve Shiraz Grenache Touriga – More purple in colour than the same blend in 2004, but with ripe dark fruits (such as plum and black fruits) on palate and nose. Good structure too. Rrp about $30. Will also cellar well (until about 2018+). St Hallett 2009 Old Vine Grenache – Grenache is an old grape variety finally making a comeback in Australia. This wine is lightly perfumed with lifted fruit, but also with some earthiness and a firm palate with tannins that sit well. St Hallett 2009 Touriga Nacional – Black cherry, plums and chalky tannins, in an overall rich and dense palate. 09 a great year for this grape variety. St Hallett 2008 Garden of Eden Shiraz – Great that St Hallett coined the term “Garden of Eden” for a wine. Plum, black fruits and cinnamon, with oak well integrated. This could have easily been an over-ripe tasting wine but it’s kept together well. St Hallett 2008 Blackwell Shiraz – Dense colour, and a big and bold shiraz, typical of Barossa. Black cherry and dense fruits, along with plenty of ripe tannins and velvety texture, and oak is well integrated. Rrp about $35. Will cellar to about 2028+. 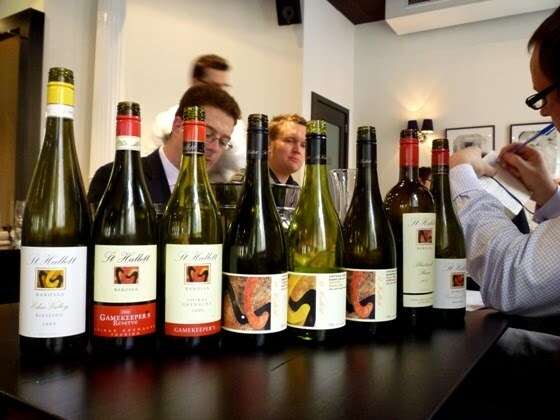 Most of St Hallett wines are pretty good value, while remaining loyal to the use of Barossa terroir and old vines. If having to choose, overall I really enjoyed the Gamekeeper’s Reserve Shiraz Grenache Touriga blends and the Blackwell shiraz. The Touriga was made well for a lesser-known grape grown in Barossa, and I think we need to see more of this… It’s good that wineries such as St Hallett and S.C. Pannell are embarking on making wines of European varieties that have not been grown or experienced much in Australia.